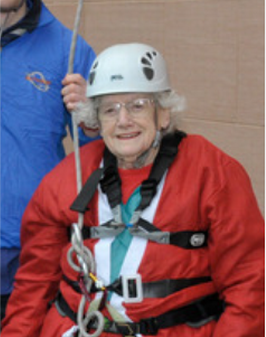 90 Year Old Abseiling Edna Receives Devon Community Honour! On December 6 the 2018 Devon Community Honours awards hosted by RHS Rosemoor will celebrate some of Devon’s most amazing individuals and Edna Cahill 90, from Exeter will be one of those people. Nominated by the public and Devon Live journalists, the people being honoured come from all walks of life, all ages, and from all over Devon. Their achievements are awe-inspiring and a lesson to us all. They say they are ordinary people, but their acts are truly extraordinary. For the past 21 years Edna has volunteered tirelessly at Hospiscare helping in all areas of patient support. “Edna’s devotion and compassion combined with sensitivity and a unique intuition for the needs of others is always evident. She has touched the lives of countless patients, family members and visitors over the years, whilst working alongside staff members all dedicated to the care of the dying. “So often visitors are feeling overwhelmed with their fears and concerns, and Edna offers them a gentle and safe place where she can focus her attention on their needs. Not just tea, but the chance to share their story behind all the distress and anxiety. She recognises their pain and suffering and helps them to find renewed strength to go back to the bedside of their loved ones. “Edna’s unique gift to Hospiscare is her enthusiasm to raise vital funds too. She has raised a staggering £4,000 from a variety of events she does, including abseiling down buildings. No mean feat, for someone of her advanced years. In short she is an inspiration to those she works with and especially to the countless number of people that she has never met before; greeting everyone who comes into the hospice with kindness, compassion and comforting smile. Hospiscare is a local adult hospice charity, providing high quality care and support to people with any type of terminal illness, and those close to them, in Exeter, Mid and East Devon. A gift to Hospiscare in your Will helps ensure the future of the charity in Devon for generations to come.